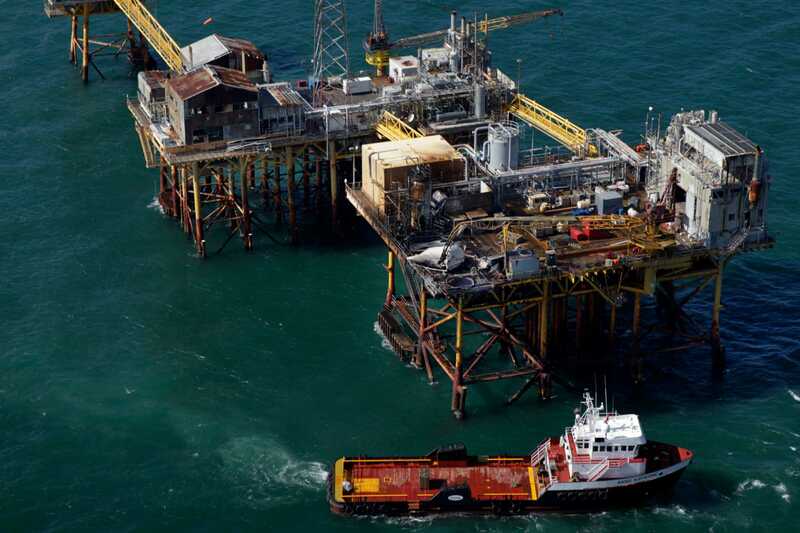 WASHINGTON - A fatal explosion on a Gulf of Mexico production platform last November was triggered by contractors conducting maintenance work at the site, according to an investigation commissioned by the Houston-based company that owned the facility. Federal investigators are still probing what caused the Nov. 16 explosion and fire at Black Elk Energy's West Delta 32 production platform, which killed three people and injured two others. But conclusions from the initial investigation funded by Black Elk and conducted by ABSG Consulting dovetail with earlier speculation that contractors were welding a pipe that hadn't been cleared of flammable gas, triggering explosions in connected oil tanks. The ABSG report deflects blame from Black Elk Energy to contractors working on the platform, including Philippines-based DNR Offshore and Crewing Services, Scotland's Wood Group PSN and Galliano, La.-based Grand Isle Shipyard. Wood Group PSN said in a statement that it is committed to safety. "We review our procedures regularly and update them when appropriate as part of our continuous improvement program," it said. Officials from DNR Offshore and Grand Isle Shipyard did not respond to a request for comment, although Grand Isle Shipyard CEO Mark Pregeant previously has rejected Black Elk CEO John Hoffman's theory that sparks from workers cutting a water line ignited flammable vapors. According to the Black Elk investigation, the fire can be traced to a pipe welding operation by DNR Offshore and Crewing Services, which Grand Isle Shipyard had hired to do the work. Black Elk said the actions violated the company's safety policies, which include a requirement that supervisors issue permits for what the industry calls "hot work" - activities that involve burning, welding or other operations that can start fires - after removing hazards. Contractors from Wood Group PSN, who oversaw day-to-day activities on the platform, issued a hot work permit the morning of the explosion. Investigators said, however, that it essentially duplicated the previous day's authorization without a fresh assessment. A study commissioned by Black Elk Energy says contractors doing maintenance caused an explosion that killed three late last year. ABSG also reported that just before the welding began the morning of the accident, a worker smelled a strong gas odor, but DNR Offshore personnel couldn't determine its source and didn't stop work. Earlier that morning, ABSG said, a pneumatic saw sliced through a pipe leading to an oil tank and a clear liquid drained out of the line. Workers believed it was water and continued activities without assessing the incident. Hoffman said Black Elk's contract with Grand Isle Shipyard precluded it from using subcontractors. He also faulted the company for improperly overseeing its workforce on the facility. ABSG Consulting's 401-page report was shared with federal regulators. They have not given the company approval to resume production at the platform, but Black Elk said it has completed repairs at the site.